We proudly announce the new release 1.2 of FREVO (FRamework for EVOlutionary design). FREVO helps to reduce the time to implement, set up and run an evolutionary algorithm to evolve an agent’s behavior as a solution to a particular control problem. FREVO supports decomposing the task into problem definition, solution representation and the optimization method. The componentwise separation allows to experiment with different combinations of algorithms and neural networks for different tasks. HEMS – a simulation for modeling trading behavior of loads and local energy generators. SinglePong – a simulation of the one player pong game where several paddles can cooperate in order to achieve better performance. 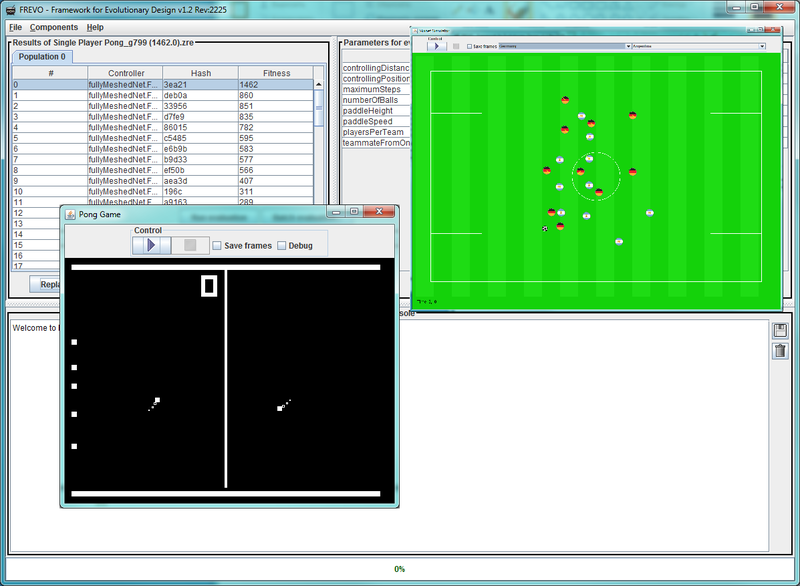 Pong – a simulation of the pong game where two teams can play against each other. A. Monacchi, S. Zhevzhyk, and W. Elmenreich. HEMS: A home energy market simulator. Computer Science – Research and Development, 2014. I. Fehérvári and W. Elmenreich. Evolving neural network controllers for a team of self-organizing robots. Journal of Robotics, 2010. FREVO – software used for the evolutionary algorithm. WMOrakel – the championship between self-organized soccer teams which were evolved using FREVO.